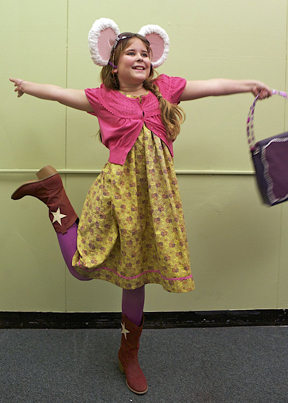 "Lilly's Purple Plastic Purse," based on the popular children's book by Kevin Henkes, will be brought to life by Boston Children's Theatre during four public performances at the YMCA Bates Hall Theatre, 316 Huntington Avenue in Boston on February 5, 6, 12 and 13. Additional performances for school groups will take place in Boston on February 8, 9 and 10 and at Endicott College on February 15 and 16. Lilly (Blaine Stevens, at left) is a young mouse with a colorful imagination and a wonderful new gift from her granny - a purple plastic purse! Audiences will see Lilly's charming imagination brought to life as her irascible antics and purple plastic purse lead her in and out of trouble. Toby Schine, the show's director and BCT's Executive Producer, commented, "'Lilly's Purple Plastic Purse' is a unique opportunity for both performers and audience members. The cast is made up of 14 students, selected from the over 60 who auditioned, as well as several local adult actors. This is an extraordinary educational opportunity for students and adults to learn from each other. I think we can all see something of ourselves in the characters, and it's a story that people of all ages can relate to. This is a perfect show for children to share with the adults in their lives." The cast features 15 young performers representing 11 communities. They include: Beverly resident Stowe Brown; Boston residents Rosie Cerulli, Ifeanyi Aghadiuno and Erica Jurus; Boxford resident Emily Gilbert; Brookline residents Alec Shiman, Nicholas Cook and Kassiani Mamalakis; Somerville resident Natalie McPhearson; Medfield resident Julia Perry; Natick resident Kirby Kochanowski; Peabody resident Karllee Hunt; Roslindale resident Isaac Haber; Rye, NH, resident Blaine Stevens;and Westwood resident Joseph Nedder. Now in its 60th season, Boston Children's Theatre was founded as a stand-alone, non-profit organization, dedicated exclusively to young people and the telling of their stories. One of the oldest children's theatrical organizations in the United States, BCT provides unique opportunities for inner city and suburban kids to work together by offering year-round opportunities for young performers to be involved in a broad range of theatrical productions. For tickets, 617-424-6634, x222 or visit www.bostonchildrenstheatre.org.